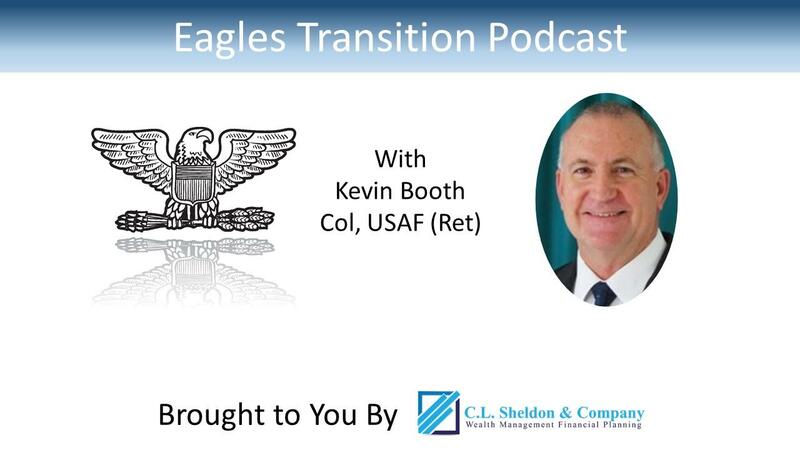 Speaker 1: Welcome to the Eagles Transition Podcast, where your host, financial planner, speaker, and author, Curt Sheldon, talks to senior military officers who have made the retirement transition before you. You'll hear about different hiring processes, interview questions, salary negotiations, and how each one of them successfully settled into a rewarding second career. Now here is your host, Curt Sheldon. Curt Sheldon: Welcome to episode nine of the Eagles Transition Podcast. Today I'll be talking with Kevin, KB, Booth. KB has taken a very unique path through his transition. He's the airport director at the regional airport that serves Steamboat Springs in Colorado and runs a relatively good size organization. KB was very effective in using both his personal network and developing a new network through networking groups. He also used one of the most unique methods I've heard of to prepare for the interviews that landed his job. Make sure you listen to the end, where KB talks about narrowing your job search to more effectively and efficiently find your next career. Curt Sheldon: Before I talk with Kevin, I'd like to make a special offer for our podcast listeners. If you go to www.clsheldon.com/eagles ... That's www.clsheldon.com/eagles ... you can get a financial checklist to help you with your transition from active duty to the civilian world. It is designed for you and you can get it for free. Now on to the show. Curt Sheldon: KB, welcome to the show. Kevin Booth: Hey, good morning, Jar. Thanks for having me on. Curt Sheldon: I'm happy to have you on the show today, because you have taken one of the more interesting paths that I think I've come across in your post-military career. So, if you could real quick, just what is your current position? Kevin Booth: I'm the airport director at the Yampa Valley Regional Airport, which is a county owned and operated airport in the northwestern part of Colorado near Steamboat Springs. Curt Sheldon: Every time I see you on LinkedIn, two things go through my mind. One is like, "Gosh, I wish I lived in Steamboat Springs and could work there." Then the second thing ... I don't know why, because I know it has nothing to do with what it's really like, but I always think of that ... I think it was in the '80s ... show called Wings, where there was a small regional airport, but it was the airline, and it was a comedy. I'm pretty sure that's not what you do; but, if you could, what exactly does an airport manager do? Kevin Booth: Well, basically I have a staff that does all of the ... We kind of divide up our airport into three areas, which is the air side, so everything from the terminal toward the runway; then, on the land side, it's the terminal plus everything outside the terminal, meaning the parking lots, curbside parking lot systems; and then everything in the terminal, which for us is the day-to-day care and feeding of the terminal itself, all the parts and pieces within it. Then, for us, we own and operate two eating establishments and a gift shop. So, those are our three main areas. Kevin Booth: Then, obviously, we host 20, 25 different tenants here, to include five major airlines. So, we have some responsibility to make sure that they have everything they need to bring commercial service in and out of here. That and working closely with our partners at the state aeronautics division and then the FAA offices in Denver from whom we derive a lot of our funding, So, major projects, improvements, even some pavement maintenance, things like that, we apply for grants through the FAA, and as long as funding is good for the FAA, then we receive a significant amount of our revenue for improvements through the FAA. Curt Sheldon: Just kind of a rough order of magnitude, about how many people in the organization? Kevin Booth: Working for me on the county side ... We're a seasonal airport because of the ski resort here; so, this time of year I have just shy of 80. Then in the off-season we go down to a staff of about 30. Then, overall for the airport this time of year we have about 500 total employees, most of those working for the tenant organizations that I mentioned before, not for me. Curt Sheldon: Sounds pretty cool, really. Sounds a lot like running a squadron or so. Why do you tell us a little bit about your Air Force career that kind of at least started you down this path? Kevin Booth: I finished up a 30-year career back at the beginning of 2014. That started with officer training school and then pilot training and then worked my way through a flying career. Worked up through the normal flow of flight command and ops officer in a fighter squadron. So, my path took me to the F-16. Then, eventually, kind of the key to where I am now had to do with the opportunity to be an operations support squadron commander in Germany for a couple of years. That really gave me a flavor of what it takes to run an airport, albeit a military airport. Kevin Booth: Then some staff work, a change in airplanes, some work in Alaska, and then eventually I finished up my career as an Air Force attache in the US Embassy in Jakarta. That was a little bit of a diversion, something different. That's where I retired from and when I started to pursue this line of work. Curt Sheldon: As you mentioned, you were an OSS, or for those who aren't in the Air Force, Operation Support Squadron commander, which has a lot of airfield responsibilities. Was it such that you could just basically step in the job and you knew what to do, or was there still quite a bit of new things to learn? Kevin Booth: There was quite a bit to learn. A job like this is kind of two-sided. There's an operations side, and that part was an easy transition. The part that probably I wasn't as well prepared for was the business side of things, so no real experience dealing contractually with airlines and the ground handlers that turn the airplanes and handle the passengers, and luggage, and stuff, and then all the commercial side. At this airport we have three major rental car agencies, two big shuttle bus services, ski rentals, and all of that was new ... not overwhelming, but new. Kevin Booth: Thankfully, I walked in to a pretty capable staff that helped me through that and a county manager who hired me, ultimately, after filling this role for a few months; so, he had a pretty good flavor of what it took to keep the airport going, what I needed to know. So, that transition went pretty well based on the mentorship I got from my boss and my staff. Curt Sheldon: Would it be safe to say that being an OSS commander ... For someone who's out there that has that experience, is that a pretty good setup for a job like this, something that most people could make the transition pretty easily? Kevin Booth: Yeah, I think so. I mean, even if it was to kind of a stepping stone. When I started down this path, the first application I submitted was for an assistant airport director. That's where I figured I'd need to break in and learn the ropes in that position, as opposed to coming in at the top of the organization. As it turned out, they took a leap of faith in me, but I was ready to come in and either be an ops director or an assistant airport director, along those lines, and probably figured, "However long it takes you to get comfortable in that role and learn the rest of the operation, then you'd be set up for success." Kevin Booth: I mean, I think what tipped the scales in my interview process was probably the experience in leadership and command. Like you said, I had the opportunities at the squadron command level and then at group command level that I think was taken well or respected by the group that interviewed me. So, I was lucky, but I was also willing to start a little lower on the totem pole, if that's what it took, to get to where I am. Curt Sheldon: You mentioned that you applied as an assistant manager at a couple other places, or at least one other place. Tell me how you found out about this job. Kevin Booth: Ultimately, when I started down this path toward airport management, I was in Colorado Springs. That's where I retired and still own a home there. I just kind of started networking locally, actually after speaking with you and going through an ETAP class, and made an appointment, cold-called the airport manager at the Colorado Springs Airport. He was kind enough to give me an hour of his time. Drove out there and sat down with him, got a tour of that airport, talked to him about what he does day to day. Like I said, I was trying to get the assistant airport manager job there. Kevin Booth: While that didn't work out, mostly because he was looking for somebody with a strength in marketing, which certainly isn't something you do a lot of in the Air Force, I ultimately didn't submit my application there and started looking elsewhere. That kind of opened the door. I met a lot of folks. He introduced me to a couple of people, made some more phone calls. Kevin Booth: Eventually linked up with somebody else that presented at the ETAP class who was kind of a career advisor. She encouraged me to branch out and find out what was up in the Denver area in the way of networking groups. Ultimately started with one group called the 905 Group in Denver and then heard about another group that might be a better fit, which is called NEXT up there. You had to apply and they looked at you. If they thought you were a good fit, then they invited you back. That's where I met some folks who then gave me some more clues on people to call and go out and meet with. Kevin Booth: Then ultimately when this job, which wasn't on my radar, came up, I had two or three phone calls the night that it was advertised from folks I'd met through networking who suggested strongly that I drive up here, and take a look at the airport, and consider putting in an application. So, that's exactly what I did the next day. I got in the car and drove up here. Pulled down the application, filled it out, brought all that stuff up here, and took a look, and submitted my application. Curt Sheldon: I'm going to want to circle back to that organization there in Denver, the NEXT, or N-E-X-T, but we'll come back to that in a second. It's kind of interesting. We always talk about networking, and in most cases it's someone inside the organization maybe taking your organization to the hiring manager, or there's a little bit of an inside connection. In your case networking was still involved, but it was just people watching out for you for the things that you might have missed. It's one of those, "You never know what life's going to throw at you." It seems like in most cases networking is still involved. Kevin Booth: Yeah, absolutely. On that topic, I would just say that through all the studies that we end up putting ourselves through, and MBTIs, and stuff, I'm more introvert than extrovert, and so networking didn't come naturally to me, but so did not working. So, added incentive there was to get over whatever resistance I had to networking. Frankly, after doing it for a month or two, it became second nature. You had things that you knew were important to get across quickly, because sometimes those networking events are kind of like speed dating. Kevin Booth: Then, once you break that ice and get comfortable with it, then it sort of snowballs. You meet somebody, and they go, "I can't help you, but I certainly know a guy, or a gal, that can help you out." Next thing you know, you're getting a phone call. I became not adept, but comfortable, with making that cold call and saying, "Hey, this is me. This is what I'm looking to do. Any advice?" I was not surprised, but encouraged, by how many people really wanted to help and really could. Curt Sheldon: I think you're certainly the first county employee that I've interviewed and, I think, actually you might be the first person that I've interviewed that actually works for a government entity. Could you talk a little bit about the hiring process? You said you basically went online, filled out an application. How did it go from there? What would one expect, at least if they were to apply for a job in the county where you are? Kevin Booth: A couple things. I did do exactly what you said, so went online, found the electronic application form, called the HR department at the county up here. Their suggestion was just to fill it out and email my application and my resume to them, and then they would let me know. But my suggestion, and what I did, was what I mentioned before. I got in the car and drove up and dropped a hard copy. I did send electronic, but I dropped a hard copy off in HR. Kevin Booth: Before I ever came out to the airport, I was able to let them know I was coming, and they gave me about an hour and a half of, "Here's what working for the county's like ... There's no guarantee you're going to get this job." I think it made a good first impression that I was willing to drive four hours up and be there in person, and they put a face to a name. The other thing I did was go out and see the facility, and that was kind of a deal closer for me, because it a beautiful airport and a really nice facility. Granted, it's kind of out in the middle of nowhere, but 20, 23 miles from Steamboat. Really nice facility. I think that made a difference. Kevin Booth: Then, ultimately, I got a response from the county manager, who set up a phone interview. So, like most people in this business, I did my homework. I had probably a week or so to prepare for that. Called up as much as I could online to learn about the county and what's happening in the county, and Steamboat Springs, and the other communities that are near here; so, prepped like for a final exam before that phone interview. Kevin Booth: I mean, I found out the day before who was going to be on the panel, and it wasn't what I expected, mostly people not from the county, but people from the city, people from the ski corporation, people from the marketing district, people from the chamber. All had to do with things that in my research I realized how important this particular airport is to this particular community economically. So, that's they did the make-up of the board the way they did. Kevin Booth: Eventually, the hour-and-a-half or two-hour interview went pretty well. I was pretty well prepared. I didn't try to hide the fact, or pretend, that I knew everything I needed to know about contractual dealings with airlines or rental car agencies, but I was just honest with them. Anyway, eventually they offered me the job, so here I am. Curt Sheldon: That's really interesting. I don't think I've ever heard of an equivalent, where someone from outside the organization that's hiring you is involved in the interview process. I get the logic. It makes perfect sense. But I don't think I've ever heard of that before. When it was all said and done, it sounds like basically a phone interview and an in-person panel interview. Kevin Booth: That's correct. That's correct. It's kind of a funny story. As I walked out of that interview, it's kind of like, "Don't leave the building, because we're going to talk about you and then we're going to bring you back in. So, you're not going to have to wait for this decision. We're going to make a decision today." Kevin Booth: As I walked out, there was somebody that was excluded from that panel that basically grabbed me by the arm and pulled me into a conference room. I did a follow-on interview while they were talking about me in the primary interview, and this was the chair of the airport commission, who wanted desperately to weigh in on the decision and wanted to interview me himself. So, they had to pull me out of that interview to tell me that the primary interview, that they'd made a decision and were going to offer me the position. Curt Sheldon: Hmm. Again, I don't think I've heard of that, either, where it's a same-day decision. I guess that's one of the nice things about being small. You can be pretty agile. Curt Sheldon: Whereas I don't imagine Denver International would have done it the same way. So, they basically said, "Yes, we're going to make you an offer." The offer came in. What was your sense? Was it a 'Take it or leave it?'" Were you able to negotiate any of the benefits? How did that turn out? Kevin Booth: There was a little bit of wiggle room. I mean, I knew what the position paid going in, because it's public record; so, there was no real surprise. I don't know. I felt like it was a fair pay for the size of the airport and the pace of the airport, that they were being fair. I knew I had some shortcomings in my resume for a commercial service airport position like that, and so I didn't intend to play hardball or anything, and I didn't have a particular number in mind. The number that I knew they were going to offer was reasonable in my mind. Based on my experience, and primarily the leadership experience, they were able to bring me up to start at below the bottom line, or the entry level pay, for this position. So, I think they did what they could on their side, and I was happy with the number. Curt Sheldon: You already mentioned that the incumbent had already left by the time you were hired, had gone somewhere else, and the county manager was kind of subbing. Was there much of an onboarding process other than, "Here's your HR paperwork that you need to get done" and "Go get 'em," or was there any formal onboarding? Kevin Booth: Yeah, less so at the airport. That, just kind of "Learn as you go." Like I said, I did lean on my staff, especially on the maintenance side and on the firefighting side, to learn quickly where our touchpoints were and where our priorities were. That part I picked up pretty quick. I didn't really get a lot of pointers on the commercial side. That I just kind of did as I went. Was a frequent caller back to my predecessor. So, great guy. He was happy to answer my questions when they arose. Kevin Booth: Then one of the reasons that I had the makeup of the interview panel that I did was because those are all important touchpoints, all those organizations: the city, the chamber, the marketing district. All of those things are something that I touch weekly, and the county manager did a great job of taking me by the arm, taking me to all the periodic meetings, introducing me, and giving me an opportunity to spend a few minutes telling people about the new guy and me telling them a little bit about my story. Kevin Booth: So, from a bringing me on the county-wide team, that went really well, and then the rest I counted on a person that was holding kind of the assistant airport director and my staff to give me the rest here at the airport. Curt Sheldon: Like I said, I wanted to circle back to the networking. Again, you're episode nine, so still a relatively small sample size, but you're the first person that I've interviewed that I'm aware of that worked with the cold-calling networking group. So, again, how did you find that? Any advice for someone who might be thinking down that road? I've done it a little bit here in DC. Like I said, I think most people don't, but any further thoughts on that? Kevin Booth: I think I'd heard it offhand in a conversation. Now, I was based in Colorado Springs, which is 45 minutes south of Denver, and so a lot of the people I interacted with in Colorado Springs weren't familiar with networking groups in Denver. But after I realized that the position at the Colorado Springs Airport wasn't going to work out for me, then I changed my focus to the Denver metro area. Kevin Booth: I mean, I think somebody mentioned the 905 Group, and I googled them. It's amazing what you can find out there. Then I called the chair of this group, and he invited me up to their next meeting. Then I just sat in and did that weekly for about, oh, probably five or six weeks. Then, during that time, somebody in that group approached me and said, "There's this other group that meets on Friday mornings, this Network of Executive Talent, NEXT, and you should just test drive them. I think there's more people in there that will be a better fit for you." So, like I said before, I did that, and that was a really good fit. So, I did that. Kevin Booth: A couple of my colleagues that I had met at some job fair functions and some other networking events in Colorado Springs, one of them was part of that group, and so he brought me with him to that and did the introductions. Then, ultimately, by the time I left that group and got hired here, I think we had four or five of us that were carpooling up to that networking event every Friday morning. Kevin Booth: So, I think word of mouth, a little bit of research on my own, a little bit from my career coach. I mean, I was even networking in Colorado Springs on the weekends through a kind of retired senior office group. I'm a golfer, and they play Saturday mornings, and they were kind enough to let me play with them. I wasn't a pest on the golf course, because I like playing golf; but, having a beer afterwards, often it'd be, "How's the job search going?" and "Have you met this guy? You should give him a call. I'll let him know you're going to call him." Kevin Booth: So, it just becomes part of your every day, especially when you don't have a 9 to 5 five days a week and you've got the time to dedicate to it. In my opinion it's well worth the time you put into it. Curt Sheldon: It sounds like you really did do a good job with that. I didn't do anything like that myself. I used professional organizations a little bit. Just since I kind of knew the career field that I went in, I joined some organizations. Like I said, you're one of the few that I've talked to that has done that, and obviously it was very effective for you. So, it's certainly something people want to consider for their quiver, if you will, of tools that they have available. Cool. Curt Sheldon: I like to always ask people if there were any big surprises, good or bad, on the money side or any money things that you maybe weren't quite expecting, maybe better or worse. Kevin Booth: Not necessarily a complete surprise. I'd say the county manager, again, did a great job of preparing me for the cost of living up here. But that part ... A reasonable salary when you're living in Colorado Springs may not be enough when you're living in a resort area like Steamboat Springs. So, thankfully, he gave me a heads up. I did my homework before I accepted the position and realized what the housing and cost of living included up here. That might have been something that could bite you. Kevin Booth: I've certainly hired a number of people since I've been here. I will never end an interview without talking to people about, "Here's the pay and here's what housing costs. Groceries and everything from A to Z is a little more expensive in a resort area like Steamboat Springs than it might be if you're in Denver or Colorado Springs. Curt Sheldon: Makes sense. Makes sense. I mean, I always like to ask people about resources. You've obviously brought up a couple. You did work with a career coach. You used some networking groups. Anything else that you might want to point out that people might consider? Kevin Booth: The other thing I did was try and target just events. I wanted to be present at things. Even after I didn't apply for the job in Colorado Springs, I continued to attend the airport commission meetings there, because I thought that would be a good insight. If I were lucky enough to land a job like this, that would be a good insight into what an airport manager/director faces and working with kind of an appointed commission. I've never done that before. I worked for a committee. Kevin Booth: So, I think you can do that. I think you can find events that touch on the area that you're interested in, whatever that business might be. Find events that's going to draw professionals from that industry and attend. Then, again, once you're in the building, don't be shy. Have a name tag. Don't be shy. Have your card in your pocket and see if you can't meet some people that might be able to shed some light on the industry or even help you find that next position. Curt Sheldon: Yeah, that's a good one as well. So, thanks for that. I always like to open it up, because I know we all miss our opportunities to pontificate that we used to have. You're open mic, if you will, to pontificate on anything else that you would like to. Kevin Booth: Again, I sound like a broken record, but I reached out to folks from my past. That, too, was ... It's not really networking, because you know these people. I had former commanders and I had people that had gone into different industries that knew me well and had either been a part of putting me in a position in the Air Force of leadership and trusted me and I felt like could give me a good recommendation. Kevin Booth: I did everything from send them my resume and ask them to redline it to the standard letters of recommendation and reference information so that, if they get a call, they'll talk about that. That, again, wasn't an easy thing. I just typically don't like asking for help like that. But I didn't have a single person say, "Why are you calling me?" Every one of them up to the level of general officers were very, very helpful and wanted me to succeed. Kevin Booth: Now I try to do the same thing for colleagues who might be interested in a position like this. I've done some advising/mentoring for, I'd say, four or five folks just in the last year and happy to do that, share some of the lessons I've learned along the way. Curt Sheldon: Okay, thanks. Along that line, if people want to get in touch with you, what's the best way to do that? Kevin Booth: Take a look on LinkedIn. Kevin Booth on LinkedIn and the Yampa Valley Regional Airport. My contact email is on there, so feel free to message me on LinkedIn or use that email and write to me, and I will certainly respond with any help I can provide. Curt Sheldon: Okay, thanks and thanks for that. Last question that I ask pretty much everybody: You said you retired in 2014. So, going back maybe early 2014 or late 2013, thinking about retirement ... You're six to 12 months out. What did you wish you would have known then that you know now? Kevin Booth: I think the main thing ... I mean, I read some of the transition books during my last assignment. I knew going in ... I even knew when I took the assignment to Jakarta that that was not the ideal place to retire from, which turned out to be true, because you can't do any networking before you hit the streets. So, I mean, I left there and arrived back in the States in mid to late November. Take that into consideration if you're considering that last assignment. I really wanted to learn a language and do the attache thing, and I don't regret it, but it made the first months of transition probably a little more challenging, because I hadn't established any real networking yet. Kevin Booth: Then, in reading through the transition books, I don't feel like I took to heart how important it is to narrow your focus. For me, specifically, for the first all six months, I was all over the map. I mean, I was doing interviews for positions that just really weren't a good fit and I didn't want to do in my heart of hearts. So, the career coach and some introspection got me looking back over my career and deciding, "I think I'm capable of running an airport in some form or fashion." Once I narrowed that focus to airport management ... It could be any focus area; but, once I stopped casting a really wide net and focused on that, then things started to happen. Kevin Booth: While I accepted this position, I was a week away from my final interview for another position at another regional airport in the Denver metro area. I mean, that focus allowed me to better prepare for the interview process, to be more knowledgeable on the industry ... All those things came together ... and it gave me more time to do those things. Kevin Booth: So, I think the main thing, if I had to do it over again: I would have done that introspection. I would have done that hard look at what really blows my skirt up six to 12 months ahead of retirement and come out of the gate ... Still take some time off. I mean, that was good advice everybody gave me: "Take some time off. Don't jump right into the job search." But, when you are ready to jump into the job search, it is very helpful, I think, to have a pretty narrow focus on what it is you want to do. Kevin Booth: I would say, during some of the interviews, the interviewer realized that, "I sense that your heart's not in this." That was the case, and I was honest with them. I wasn't doing it just for the experience of interviewing. I just didn't know what I wanted to do for a while. So, if you can do that ... It might take a career coach. It might take just some self-analysis. I don't know. Take a look back at where your passion is and see if there's an industry that matches that. Curt Sheldon: That's interesting. In my world it's just the opposite they talk about, or the same concept: "Don't be a generalist. Find a niche that you can focus on. Know everything about it. Don't try to be everything for everybody." At least in your case, that makes perfect sense. If you're living, breathing becoming an airport manager, you're going to be better prepared for interviews. You're going to be talking to the right people instead of wasting time, and you don't have to relearn a dozen different industries just to get through interviews. So, I think that makes a lot of sense. Curt Sheldon: With that, KB, I think we'll go ahead and wrap it up. I want to thank you for coming in. A lot of good stuff. Like I said, a different path going with the county. You've done some things that other folks haven't done that I've talked to in the career transition and a lot of good nuggets there. So, again, I want to thank you for coming in. Kevin Booth: All right. Thanks. Curt Sheldon: I hope you have a good rest of the ski season. Kevin Booth: All right. Bye bye. Speaker 1: It's not easy balancing the demands of active duty and searching for your second career. That's why we put together a retirement financial checklist tailored for senior military officers. With it, you'll organize your financial affairs and avoid mistakes when you retire. The best part is, it's free. You can get it at clsheldon.com/eagles.